Far too early on a Saturday morning in Singapore, abruptly awakened by Facebook notifications, I peeked a bleary eye at what was happening. 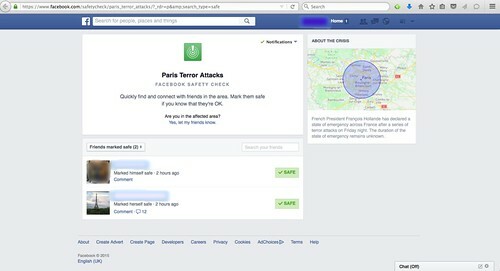 Two friends had, in quick succession, marked themselves safe in Paris, on Facebook’s Safety Check. No, I’d thought. No, no, no. insisting that it is grossly misrepresentative to say the Islamic State is Islamic (The Slate). Another group has been greatly offended. 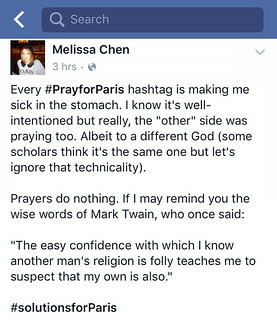 Their cause of anger: #prayforparis and #prayforhumanity. 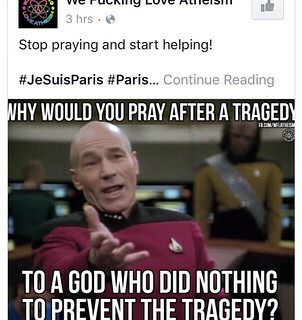 Au contraire, God is neither powerless to prevent evil, nor does he ignore the tragic consequences of evil. God is so concerned with evil and that most of the Bible, God’s word, teaches how he has dealt with it and will deal completely with it. Good news for the good guys? Yes. 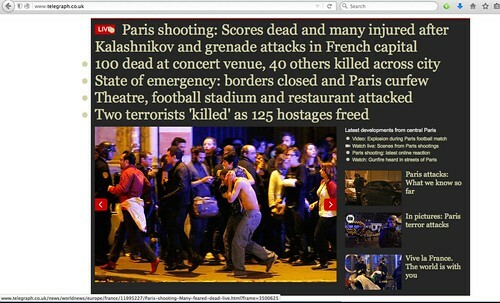 But bad news for all of us, the whole of humanity. Because evil isn’t out there – not zombies, not another country or race or economic group or political party or bloodthirsty terrorist group, it’s in us – it is us. Since the Fall, every intention of the thoughts of the human heart has been evil continually (Genesis 6:5); it has been deceitful all the time and desperately sick (Jeremiah 17:9); out of the heart comes evil thoughts, murder, adultery, sexual immorality, theft, false witness, slander (Matthew 15:19). No one seeks for God or worships him – the ultimate definition of sin. If God had dealt completely with evil at the Fall, none of us would exist. If God comes to deal with evil now, all of us, on the basis of our own records, will have to be wiped out for justice to be done. So as I write this and as you read this and life goes on around us, it is erroneous to ask why bad things happen to good people. Because there is no one good, not even one. (Romans 3:10). No one seeks for God. The real question then is this: why do good and bad things happen to us bad people? Why does the sun still shine on us? How can we still enjoy life and love and companionship and food and air? “the heavens and earth that now exist are stored up for fire, being kept until the day of judgement and destruction of the ungodly. And what does repentance look like? It is acknowledging that we have forsaken the true and living God and have wickedly chosen to live our own ways. It is turning back to acknowledging God and trusting his promise that the blood of his Son, Jesus, who died on the cross, has paid for our sins. It is submitting to the lordship of this Christ. It is to this God whom we pray. It is this judge Jesus whom we must fear. So yes, ISIS is scary but “Do not be afraid of those who kill the body but cannot kill the soul. Rather, be afraid of the one who can destroy both soul and body in hell” (Matthew 10:28).